Synopsis from Goodreads: When an ordinary kid learns he’s the heir to a secret agent dynasty, F.A.L.C.O.N puts him on a case to protect a famous rock group and find a missing journalist. Before he knows it, Colt Shore has gone from body guard to rock star to full-fledged agent when he learns that a human trafficking ring plans to kidnap a group of teenage girls. It will take more than his ingenuity and skills and a couple of cool gadgets to protect his new friends and rescue the captured girls before it’s too late. My review: This book was such a great surprise for me. I didn’t expect to like it as much as I did and I can honestly say that this is one of my favorite books of 2013! Agent Colt Shore had it all; action, adventure, secret agents, cool gadgets, and a really great plot to top it all off. Right from the start we are thrown into a world where there is a high school set up for secret agents in training for a company called FALCON. But, unlike other YA books where the characters are placed into this school and they have to go through the whole “who am I? I’m not a *insert type of person here including but not limited too; vampire, werewolf, etc. * No, Colt knew from the start that he was an agent in training which I really liked. Of course there were secrets here and there that were revealed and that definitely made the book all that more interesting. As Colt begins his adventure, and right up until the end, I liked how we kinda of got a history of the different places he was going or a connection to real life events that had transpired in different places of the globe. This made me a lot more interested and curious about the real life issues going on in these settings and often I’d set the book down to do my own research, which was way, way, cool. Agent Colt was one of those characters that I felt an immediate liking to. He was level-headed and wise despite the fact that he was a 15 year old newbie in his field, but he just had this aura about him that drew you in. Also, often with books like this about secret agents and adventure and stuff you feel that the characters get too lucky, but I didn’t feel that way at all. All of the obstacles that Colt had to overcome sounded reasonable and like something that could happen in real life. Overall, it was just a really awesome and fantastic book. I can’t express to you how good it was. Of course, once I finished the book all I could think was, when is this going to be made into a movie, and when is there going to be a sequel? 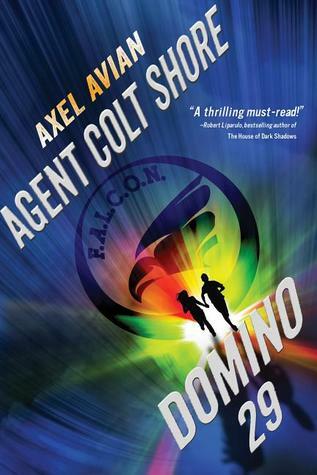 Here’s some more info about Agent Colt Shore: Domino 29 and Axel Avian, the author! axelavian@gmail.com – write and say hello or ask questions . AxelAvian.com – Come and browse the site for more on locations and characters in the book. PLUS – a challenging Android and iphone game ap called Agent Colt Shore: Falcon Academy on the website to be released on May 15th as well. You can follow Axel on Instagram!! Want to win the book for yourself? Enter below! We have five books to give away! Thank you for the amazing review!! Colt will be back in 2014 with The Games Begin. There may be no literary genre more capable of stimulating the imagination than that concerned with international intelligence and covert operations. The combination of maleficent conspiracies, globe-spanning action and the barely credible skills of the lone agent make a mythic combination. We are swept from our quotidian mediocrity into an imagined environment where the extremes of human thought and behavior are the norm, and our innermost fantasies indulged. This book needs only you to ignite a dream.